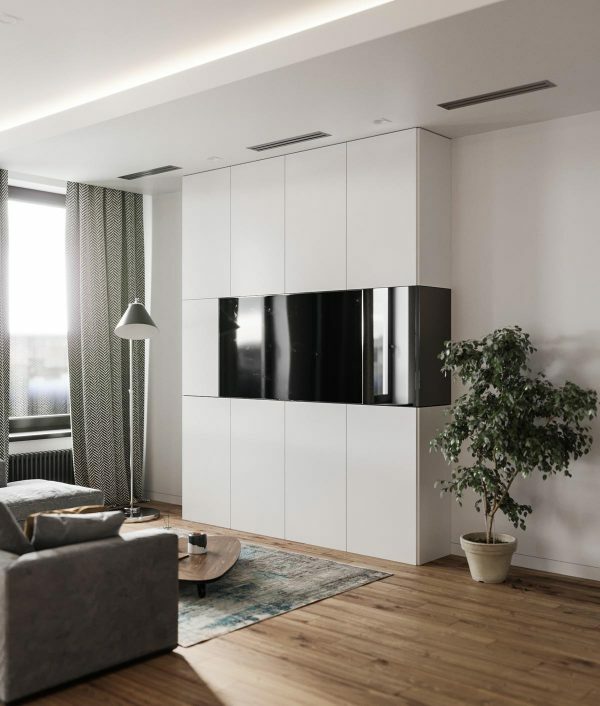 Modern interior design is most often simple and at times minimalistic. Compared to days gone by, this no-frills aesthetic can lack a little glamour and suave sophistication. 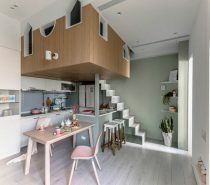 So, is it possible to achieve a hint of luxury and elegance within a modern home setting? 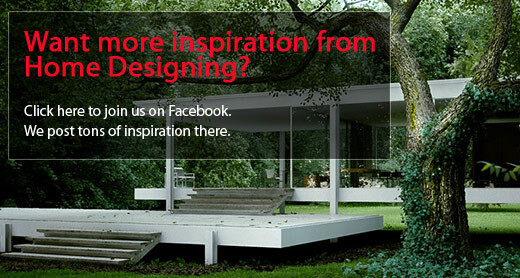 We think so, and so do the designers of this contemporary home tour. 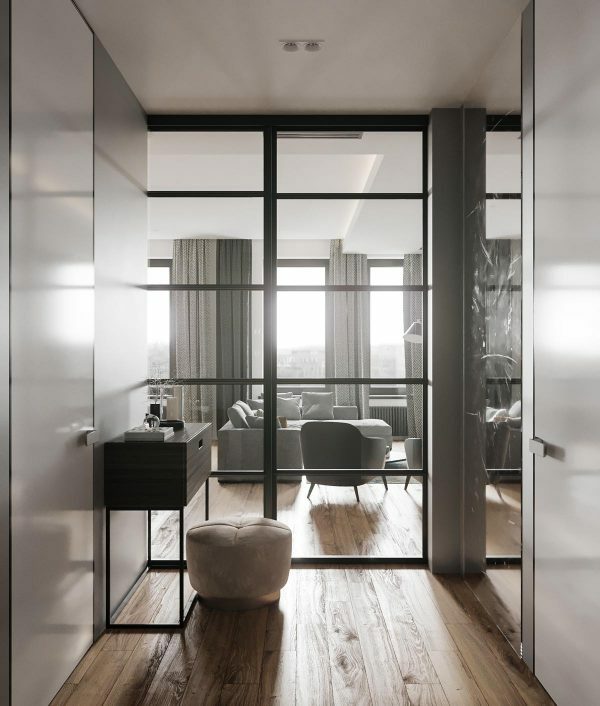 Vizline Studio in Minsk, Belarus have put together an interior that uses coy curves, light reflective surfaces for sparkle, and layered texture. 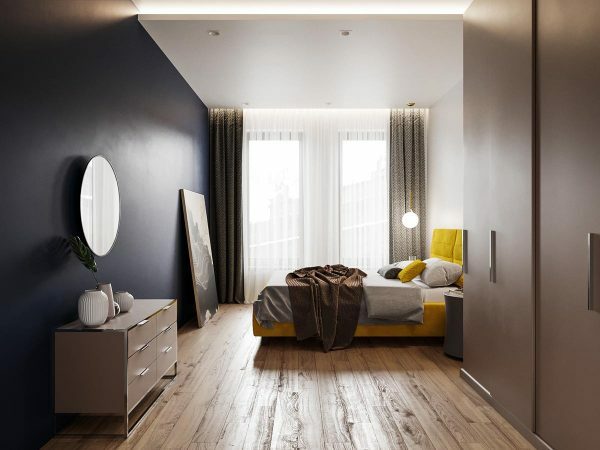 Careful use of coloured elements creates a thoughtful scheme over each room, with no hue dominating too strongly. 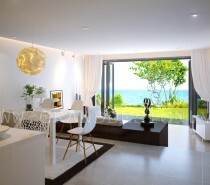 The result, a space that has great maturity with a youthful edge. 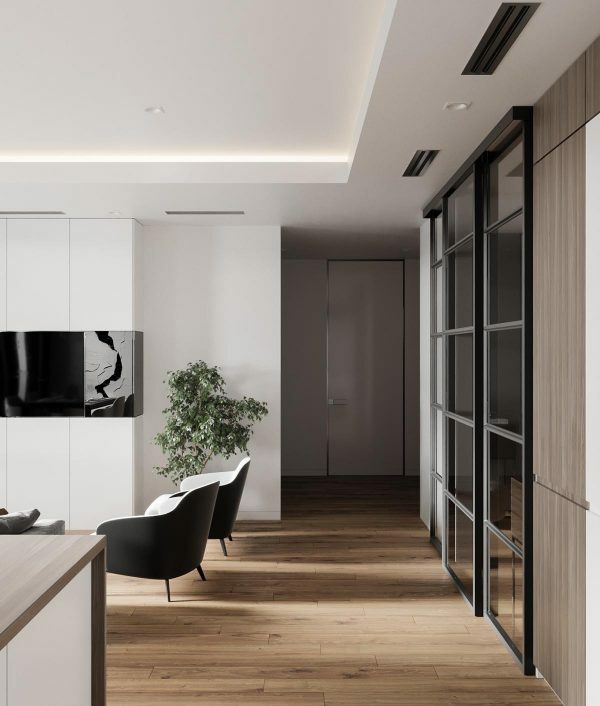 An open plan living area allows us to see several modern home design favourites all in one take: A minimalist kitchen with breakfast bar, an L-shaped modular sofa to divide and wrap the room and cool pendant lights. What makes this place different? First of all the curvaceous accent chairs are a subtly glam addition. Typically we find much more linear choices teamed with a sofa like this but these have decidedly more “va-va-voom”. 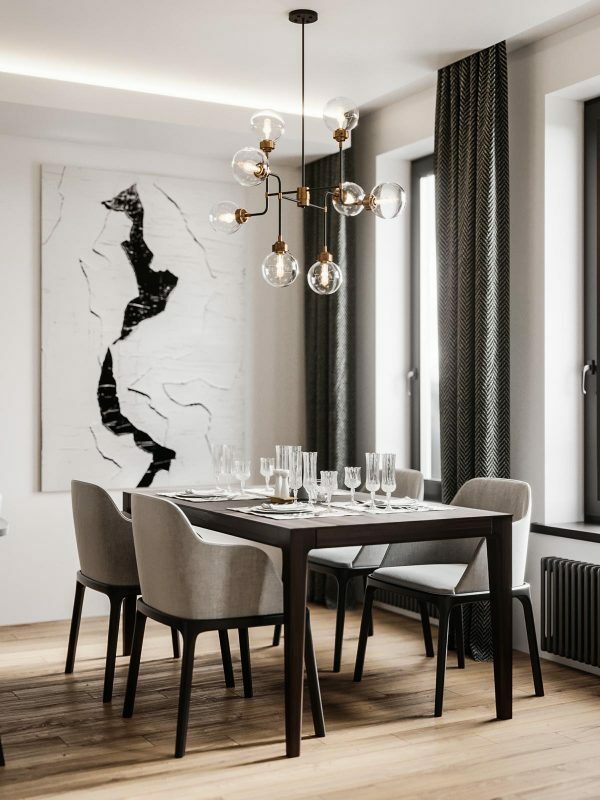 Their shape is complemented across the room by swirling artwork behind a dining area. The curvy silhouettes of the chairs also go beautifully with a mid century modern style coffee table that has been placed on an area rug. The rug offers just a hint of blue in contrast to a tan coloured throw pillow up on the sofa. 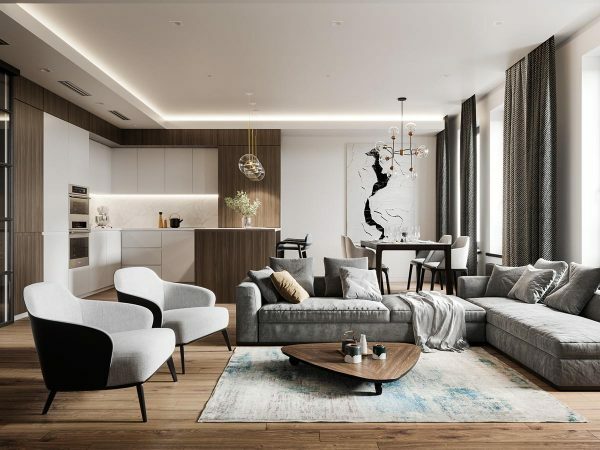 The curvaceous elements in the room are juxtaposed by simpler outlines to keep things crisp and modern; like the basic frontage of the entertainment unit and a unique floor lamp. A large house plant works to soften the harsher lines somewhat. 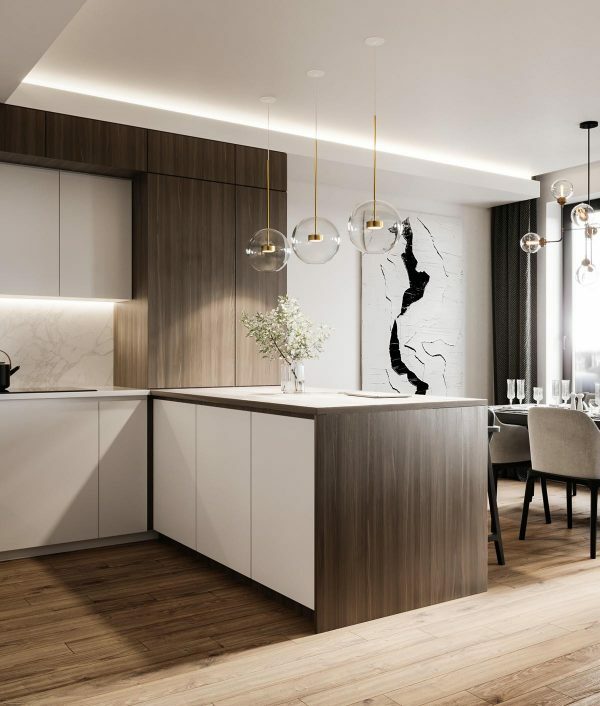 Although of contemporary industrial style, the dining lighting has a distinctly glamorous feel through rich copper detailing and shiny glass orbs. 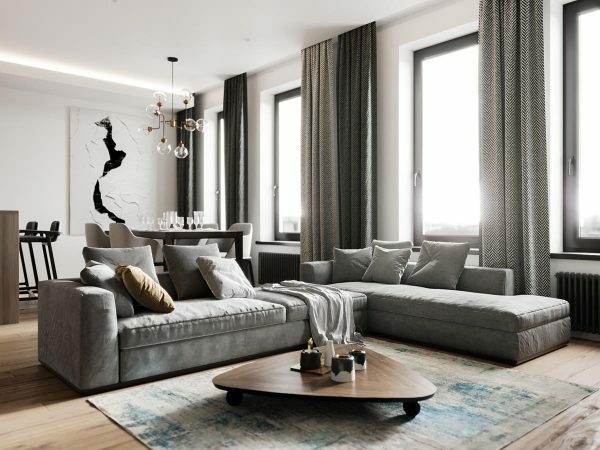 The curtains here are a heavy dense fabric that suggests high quality, whilst having a modern chevron print in an understated grey and black colourway. 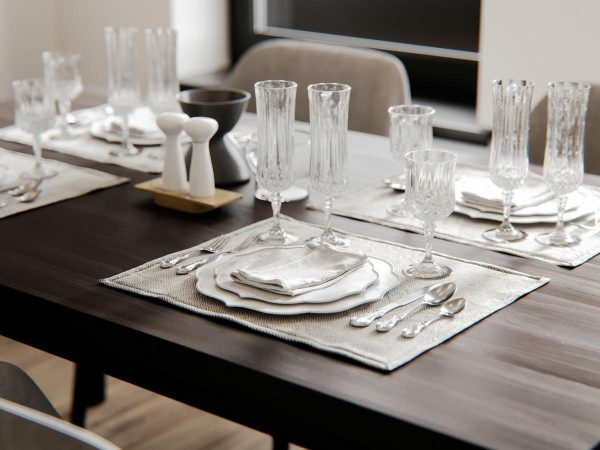 Unique wine glasses, polished silverware, fine crockery and table linens are the height of sophistication. The table might be small but the setting is dinner party ready. 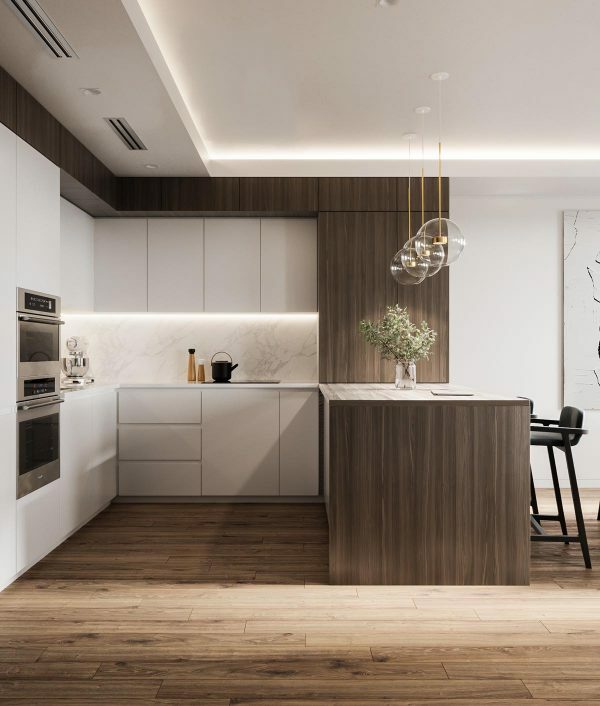 Kitchen pendant lights match the metallic elements and sparkling blown glass of those in the dining room. 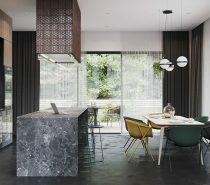 Here three separate pendants hang like jewellery over the breakfast bar, making the casual dining spot appear not so casual. A subtle spray in a decorative vase makes an elegant centrepiece. 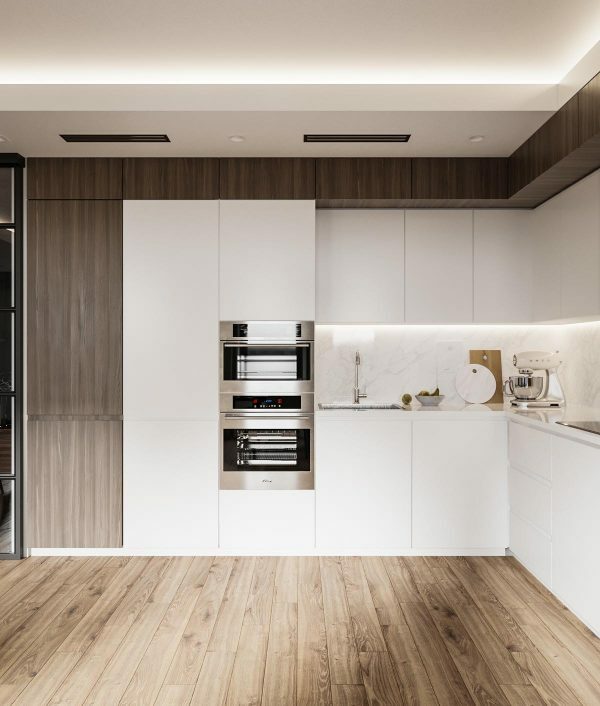 The minimalist kitchen cabinets are a combination of white and smooth walnut. 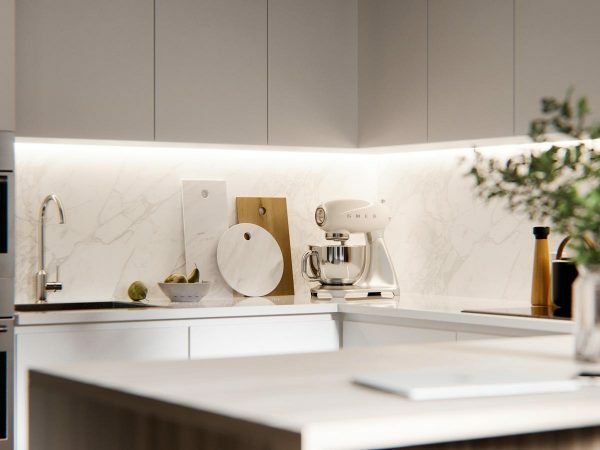 White marble is installed as a luxurious backsplash, and cutting boards have been specially selected in a matching finish. 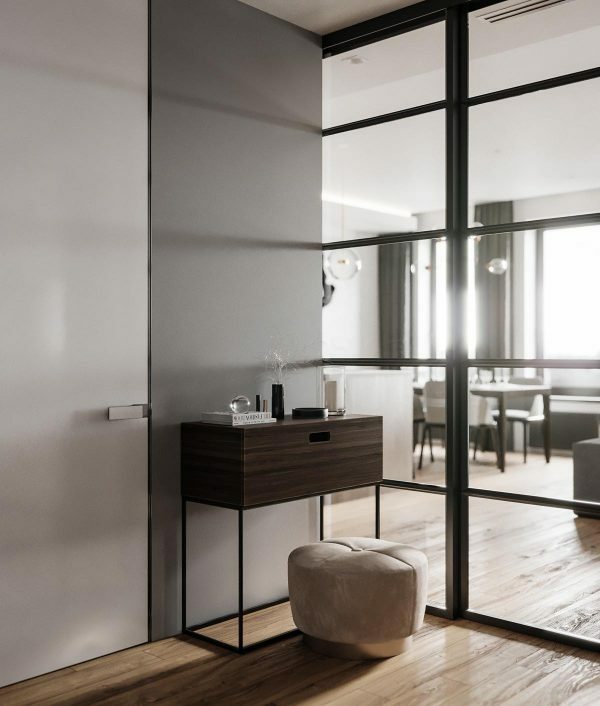 An interior glass wall cut through with a black frame divides the lounge from the home entryway. A plush upholstered dressing stool sits at a hallway console. 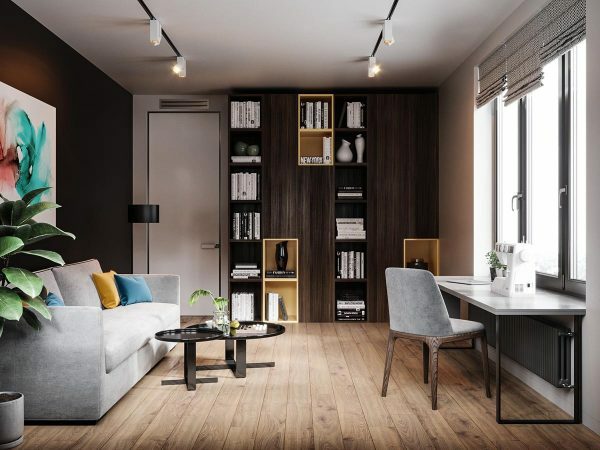 The decor is smooth grey and white with warm wood floors. 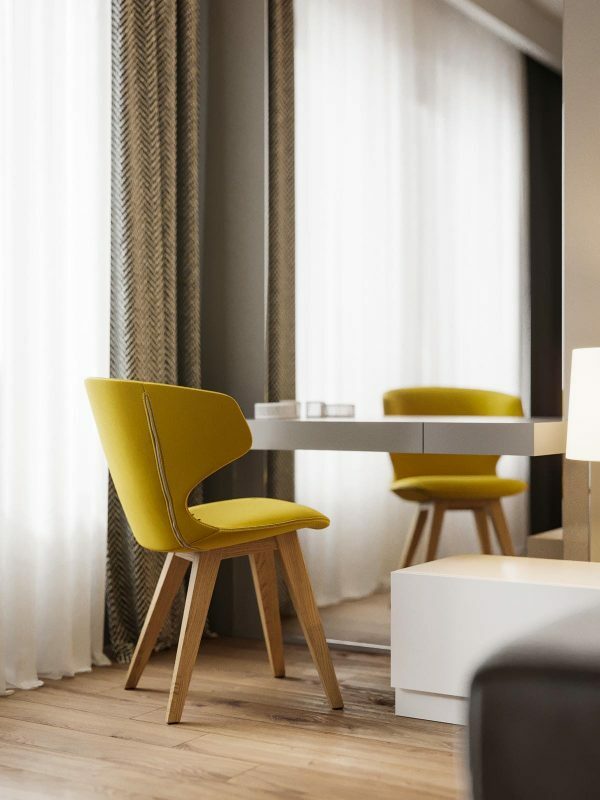 A master bedroom is decorated in earth tones with one singular contemporary pop of yellow in an accent chair. 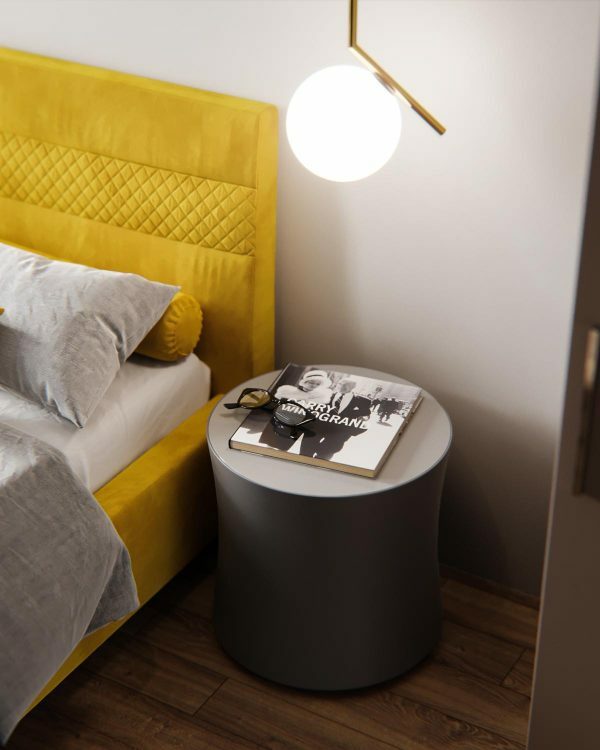 By the cosy cushioned bedstead, simple white units each hold a modern bedside table lamp. 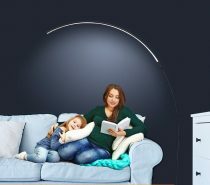 A piece of artwork hangs over the headboard, depicting smoky swirls. 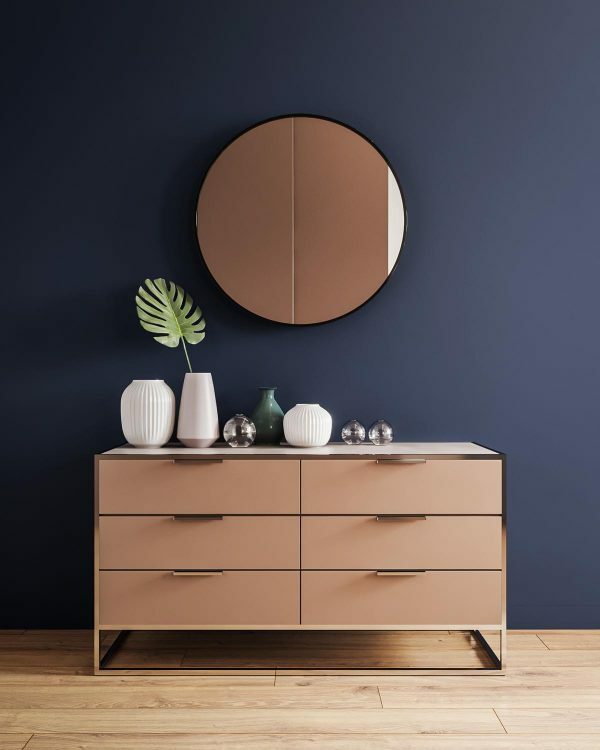 A floating dressing table is backed by a huge mirror. A study/hobby room has a dark base but is brightened with the introduction of just a few vibrant cushions and one piece of wall art. 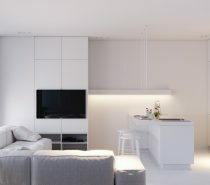 Wall shelves are set amongst storage cupboards of contrasting tone. In this room, window blinds have been made from the same fabric as are the curtains in the rest of the home, creating a cohesive look. 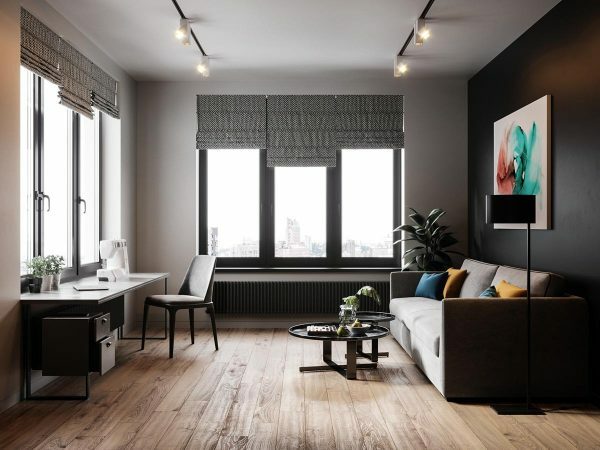 The desk is adorned by trio of metallic planters, peeping out over the cityscape beyond the window pane. Scatter cushions look sumptuous in velvety yellow ochre and peacock blue. 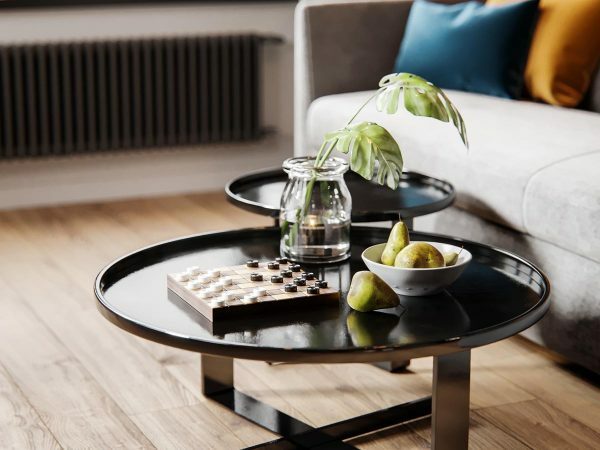 A small draughts set makes a traditional looking table decoration, grouped here with a miniature fruit bowl and a decorative vase. 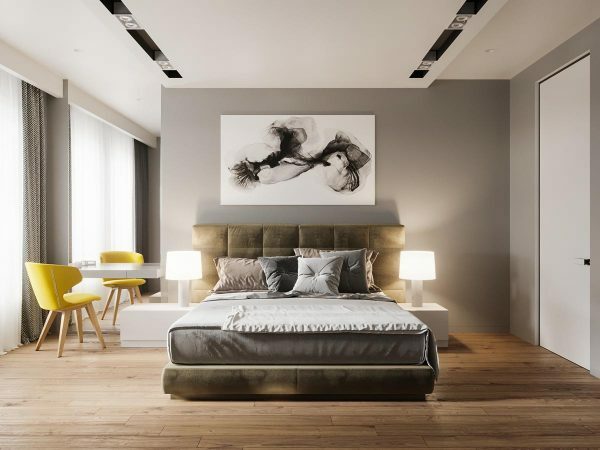 In a second double suite, bedroom pendant lights hang low over drum bedside tables. 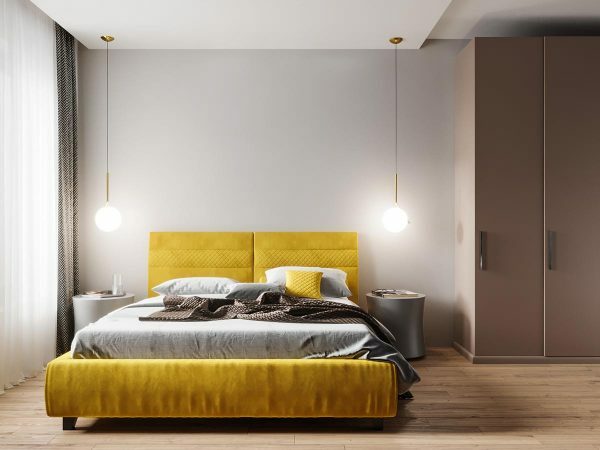 The Modern Globe Pendant Light has copper detailing that goes well with this yellow upholstered bed. The bedside units have no storage drawers but serve as a spot to keep a current book. A navy wall is painted opposite biscuit coloured closets. A matching biscuit brown console stands beneath a dressing mirror, decorated with a mixed selection of vases. 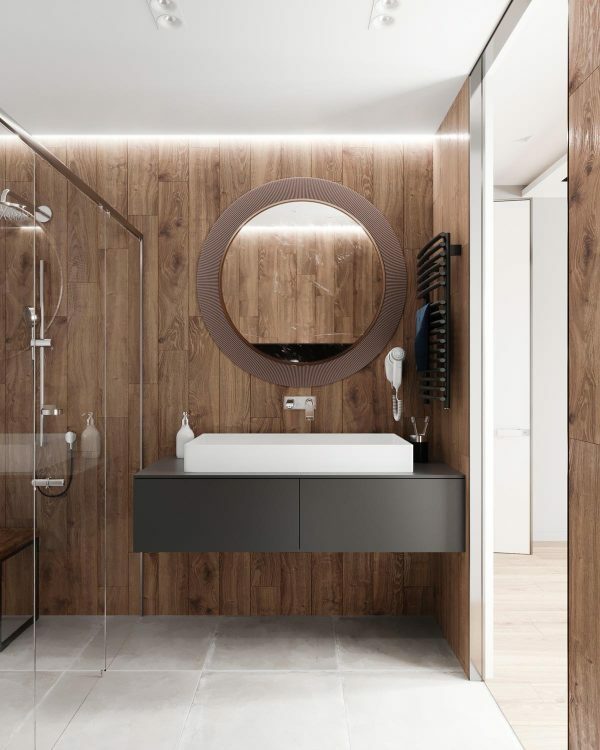 One bathroom interior has its walls completely covered in wood. 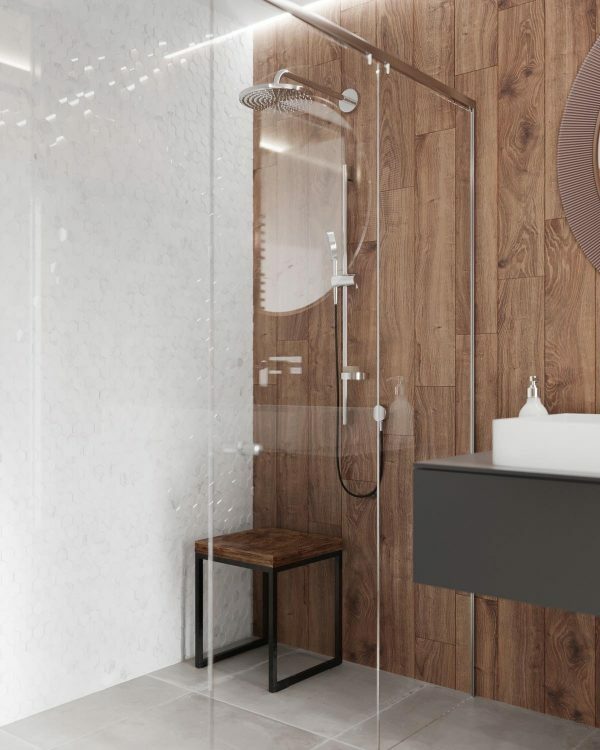 The wood wall cladding continues into a screened off shower area. 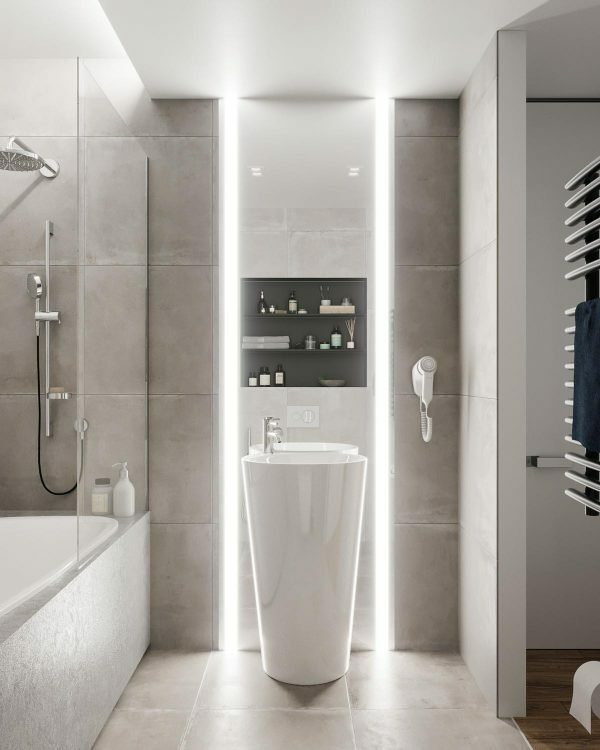 A second bathroom is a much brighter affair with large lighting strips running in tram lines down a vanity wall. 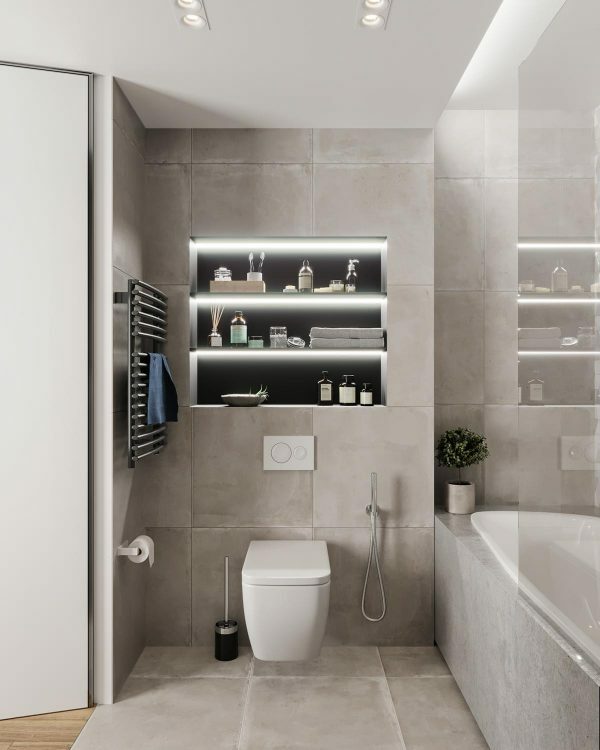 More lighting strips illuminate recessed shelving over the toilet. 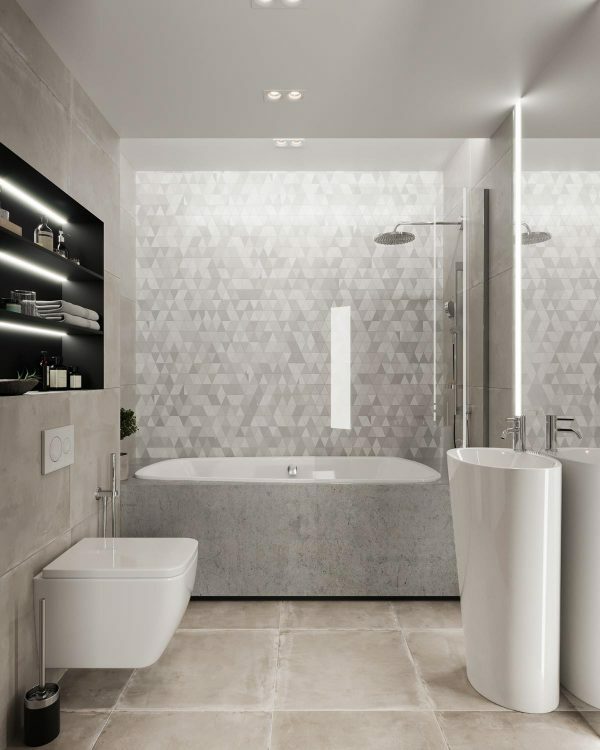 Set into a concrete surround, the bathtub is backed by grey geometric pattern. 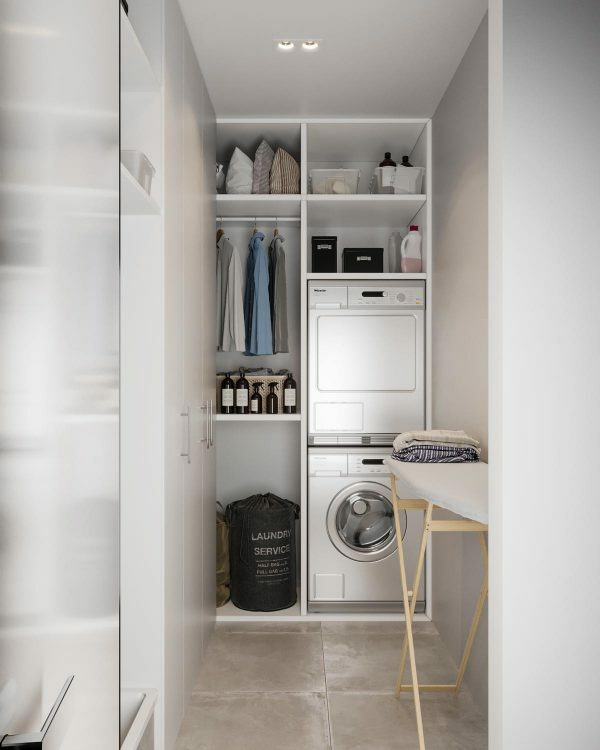 This utility area keeps necessary equipment tucked away, like the washing machine, tumble dryer, ironing board and laundry bag. 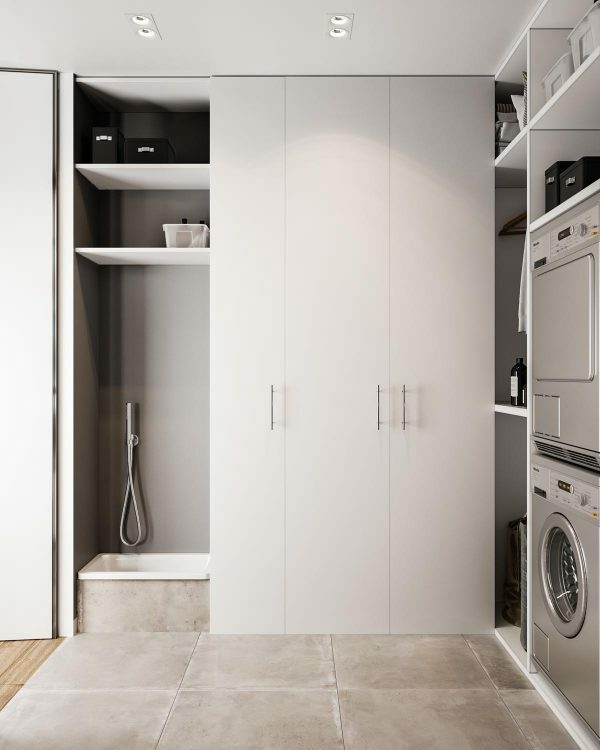 Next to a bank of storage cupboards, a shower down area is also available. 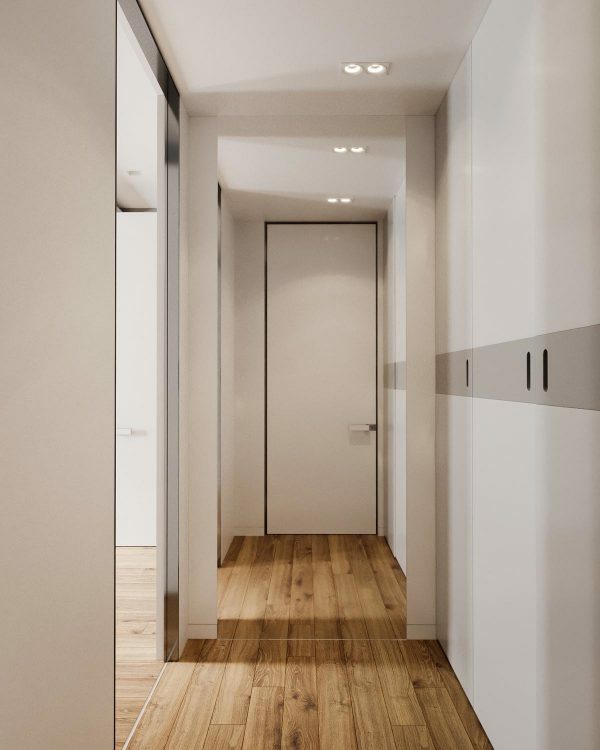 This walk-in closet has a dark dramatic design, which is lit by strips of warm white LEDs along the shelves and garment rails. 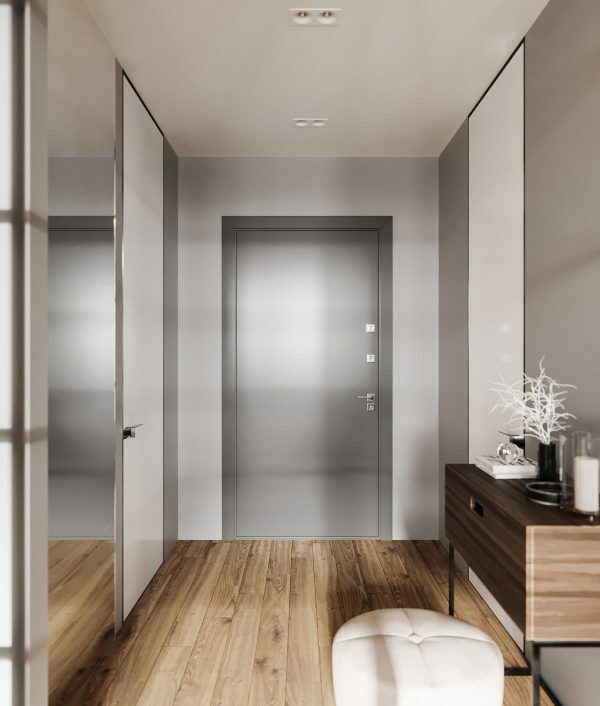 Another closet has a grey horizontal stripe running across white gloss doors. 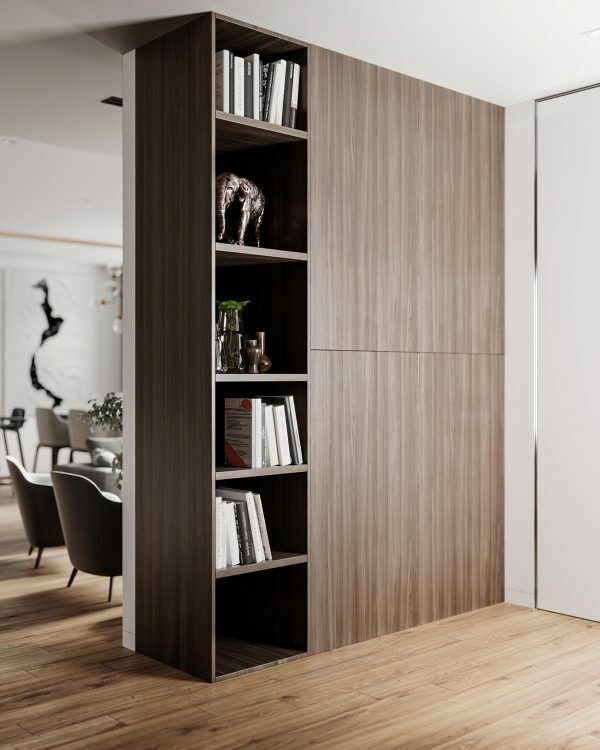 In the hallway, walnut cupboards and shelves provide storage and opportunity for decorative display. 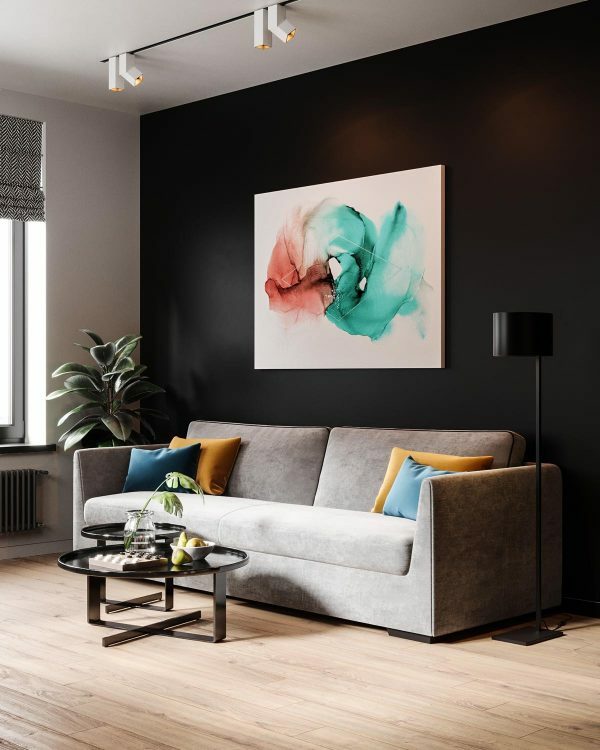 Large artwork sits on the floor, casually propped against a wall. 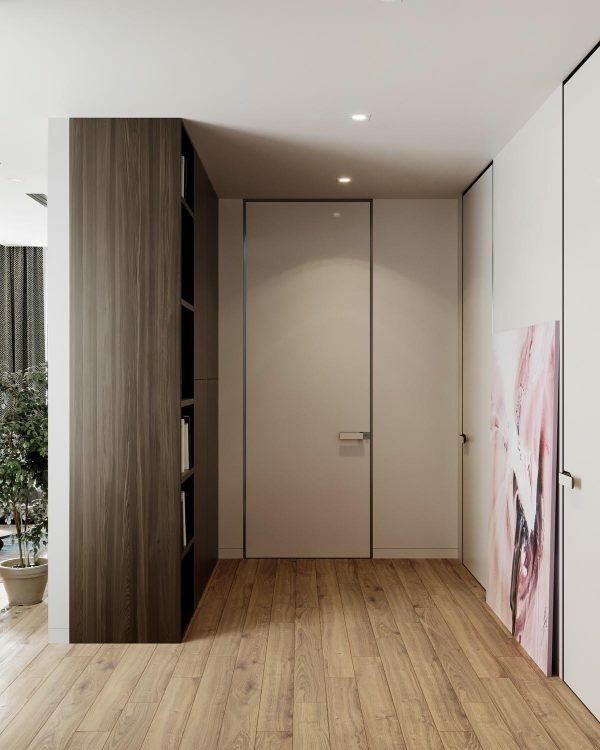 An opportunely placed mirror next to closets increases the sense of space.